The purpose of artificial intelligence is to make life easier. From virtual assistants to targeted advertising, this broad field sits at the forefront of tech news after years of behind-the-scenes work and investments. AI’s role in creating intelligent customer experiences is now on full display everywhere from Starbucks to Spotify, meaning businesses are catering to consumers faster and delivering more curated recommendations than ever. And AI isn’t showing any signs of slowing down. Despite AI’s being relatively new to the public consumer scene, I’ve seen its potential to attract the curiosity of the world’s largest brands for the better part of the last decade that I’ve been working in the field. Early investments and efforts to embrace the technology have translated to significant changes to the way many companies interact with customers. These notable examples all demonstrate AI’s impressive effects on customer experience. Just recently, Virgin Holidays released news of a successful AI content generation process that it’s been testing over the last three years. After underwhelming results with open rates, the travel company decided to use AI technology to create email marketing subject lines. Using AI for content creation is a relatively new concept—and three years ago it was relatively unheard of. The subsidiary of Virgin Atlantic gave Phrasee, a marketing language generation startup, the chance to step in and take over for its creative team, which was limited by a slow internal feedback process and a reactive mindset. Phrasee’s technology used feedback about what words or phrases were getting the best engagement from consumers to change subject lines continuously. The results have been overwhelmingly positive for both companies: young Phrasee’s new AI-based content generation technology has gotten big-brand attention, and Virgin Holidays has seen their open rate increase by two percentage points—if we use average open rates to estimate, it’s likely Virgin saw a 10% increase in open rates, which has translated to demonstrable benefits for the company. Netflix began as a mail-order DVD rental service that quickly transformed the way most people watch TV. Now a major player in television production, Netflix is credited with giving the TV industry an entirely new life. AI has taken on a major role in the streaming side of the business since Netflix’s 1997 inception. Its recommendation engines now run on machine learning algorithms, which use account records of every movie or show a person has ever watched to create specific profiles and customer clusters. Using those larger clusters, Netflix’s machine learning algorithms track what customers with similar preferences watch and make recommendations based on content that’s popular among customers within the cluster. This means users log in to Netflix and see a tempting list of new show recommendations that lead to missed bedtimes around the world. The more data Netflix gets for a given customer (i.e., the more someone watches), the better recommendations it can deliver. AI thrives on data—the more it has, the more it learns. Amazon shoppers who have found themselves adding several new items to their shopping cart after seeing them on convenient “other customers bought” or “recommended for you” lists have AI to thank for those irresistible suggestions. Amazon takes information about products customers search for and purchase while logged in to their Amazon accounts and uses them to inform its machine learning algorithms. Using that information, the behemoth brand also creates customer clusters based on purchases and learns what similar products will interest likeminded shoppers. Originally known as just an online bookseller, Amazon was once considered behind in the field of AI. Smart investments in AI in the last decade have contributed heavily to the brand’s current position as one of the wealthiest companies in the world. Focusing heavily on AI has enabled Amazon to develop more sophisticated recommendation algorithms. It now delivers highly refined suggestions rather than generic add-ons. With machine learning, those suggestions continue to get better every day. Of course, companion product recommendations are older than AI, the internet, and Amazon combined—savvy business owners and salespeople have been suggesting add-on products for as long as stores have existed. But until now, online retail companies haven’t had the benefit of tenured sales agents encouraging each customer to buy more. Amazon’s machine learning models now deliver a human-like degree of expertise to online shopping in real time, across millions of customer accounts. Using a robust loyalty card program dating back to 2001, Starbucks brings a personalized experience to customers with the help of AI. Starbucks first launched its loyalty program long before AI and data science were major industries. Fortunately, that decision to collect what became a mountain of useful data regarding customer habits, preferences, and trends gave Starbucks a big advantage when AI became a larger part of the customer experience. Starbucks now feeds its data into machine learning algorithms, which inform the recommendations, discounts, and notifications that its mobile app sends to users. Launched in 2011, the Starbucks mobile app is the company’s main channel for AI-driven intelligent customer experiences. When users order through the app, they get real-time suggestions for food or beverages to add to their order. Starbucks can’t yet use AI to make recommendations for customers placing an order in-store, but that could change. If Starbucks chooses to invest in facial recognition technology, personalized recommendations and account information would become available to baristas each time a customer walked through the door. If Starbucks’ past progress is any indication, more progress in this area is likely. AI is an incredibly broad term, encompassing everything from Google Duplex to deep learning models, and it has a similarly expansive reach across industries. I’ve seen the technology significantly alter the way brands think about serving their audiences and continue to inspire the development of increasingly intelligent customer experiences. Brands that use machine learning will save customers time and energy by handing them recommendations that they know will work for them. The process builds brand loyalty and increases convenience, offering significant benefits to both business and consumers that only stand to grow as the technology advances. 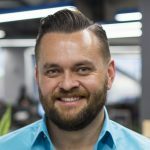 Landon Starr leads the data science organization at Clearlink, which includes the information management, advanced analytics, reporting, and CRO teams. His organization builds AI/machine learning capabilities, manages experimental design and creative A/B testing processes, optimizes UX, and architects the information management backbone to support the breadth of data capabilities that enable Clearlink’s intelligent customer experience platform.